Last week officially marked the start of Christmas present wrapping for me! As you probably know, I like to start really early when it comes to Christmas present shopping! My goal is that by the first of December I'm pretty much done! That way I can focus on decorating our house, wrapping gifts, and really honestly enjoying the Christmas season with my family. I'm not one to want to stress out all December long and try and find "the perfect gift" for all my loved ones along side everyone else. Have you been to the mall lately? Sheesh. No thanks. So I start in the beginning of October and with each paycheck we get, I spend a tiny bit on gifts for loved ones! Two months later, I'm done! Can't beat that. The weekend after Thanksgiving, my husband and I spent a day removing all of the Fall decorations (bye pumpkins and orange brown leaf thinggies) and put up our Christmas stuff. Best day ever. I flipping love Christmas! Lights have been hung, stockings are out (even two little ones for the kitties), and candles are everywhere! We have yet to get a tree, but it's coming soon! Eeeeep! So that whole next week, I started my present wrapping. Does everyone else think wrapping gifts is just the bees knees, or am I just really weird? I know my husband loathes it. I just don't understand. I actually asked if he wanted to do it with me one day (with tea and Christmas music playing) and I think I saw a tear. Haha. It's like a drug to me. I look forward to it every single time and get this strange giddy grin upon seeing my floor covered with scraps, ribbon, twine, tags, and what have you. You know who else loves wrapping presents? This girl. Actually to be honest, she loves when I wrap presents. That way she can sit on everything, knock stuff of the table, and rip my nice paper to shreds. She's the best. Anyway, one thing I'm always looking for are awesome unique gift tags! I have this slight obsession with them. I actually have a folder on my desktop that I will put new ones into every time I come across a cute design, throughout the year. Plus I love the idea of supporting fellow artists out there! 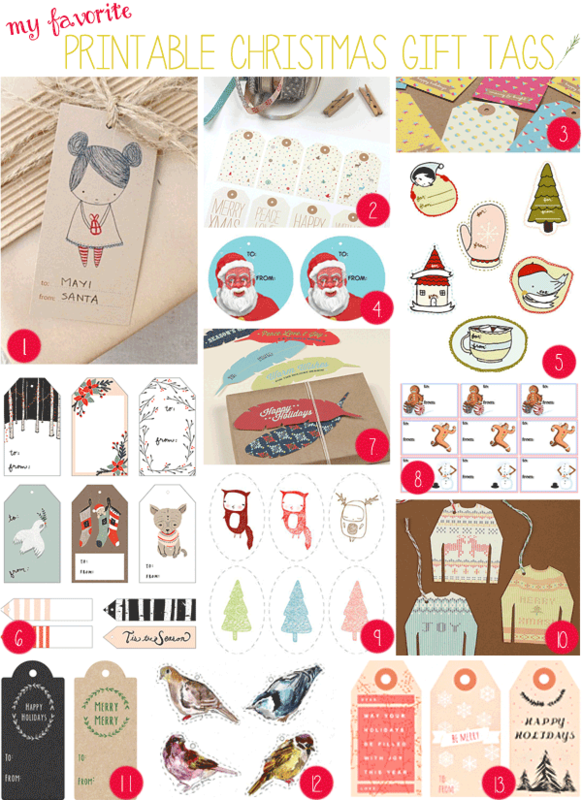 So here are a few of my favorite Christmas gift tags I'll be using (again) this year! Enjoy! The sweet little drawings on these holiday gift tags are enough to make any package cute as can be! I have literally used these gift tags for the last three years- I just love them to pieces!! Every year I print them on card stock and I'm good to go! If you have friends and family who love colorful things, then these bright holiday gift tags would be perfect on top of their package! Santa got into the Eggnog a little early this year. These sloppy Santa gift tags would make a hilarious impression! I almost want to adorn every package with these mitten and hot cocoa tags! Again, another personal favorite- I have used these gift tags every single year for the last few years! I'm loving the unique shape and design of these feather gift tags! Do you love grumpy snowmen or gingerbread men who are running for their lives? Then you'll just adore these quirky holiday gift tags! How cute are these little christmas tree gift tags? Pure. Genius. I am just loving these ugly Christmas sweater gift tags!! Ahhhggg! These chic free printable gift tags would make any wrapped present super snazzy! Maybe you take everything Portlandia says seriously and need to "Put A Bird On It"...if that's the case, these birdy gift tags got you covered! These hand drawn cute Christmas gift tags are a new favorite! Oh my goodness! These are all so delightful, and unique. I haven't seen these floating around anywhere else.